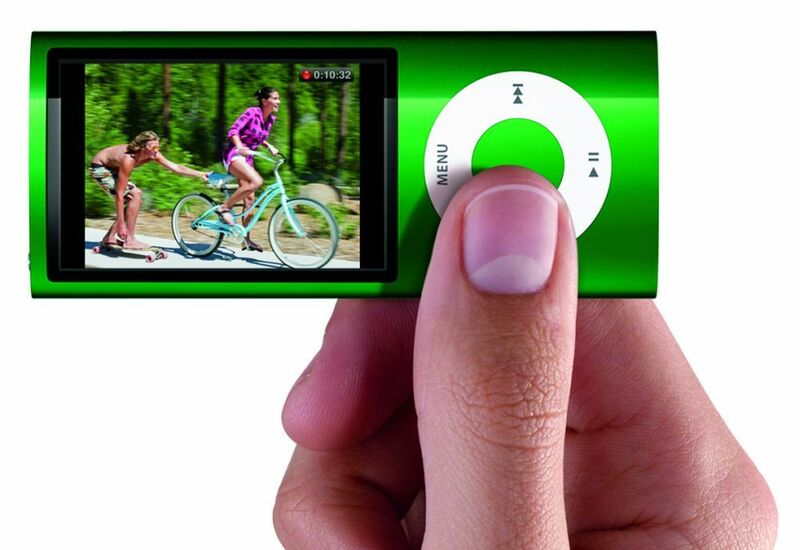 Jobs went on to announce the launch of a new line-up of iPod Nanos that would come with a built-in camera! 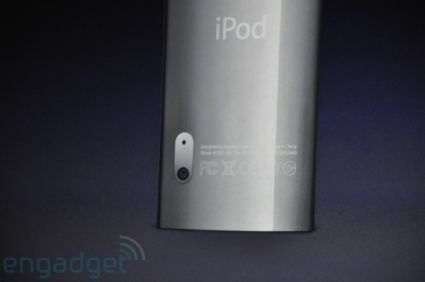 And they will still be as sleek as before, at just 6.2mm thin. For lots of images, scroll down to the image gallery below. It shoots H.264 VGA video (640x480 pixels) at 30 frames per second with AAC audio. Built-in microphone for audio recording, and speaker for quick playback. Built-in FM radio with live pause and iTunes Tagging. Live pause lets iPod Nano users pause and resume playing their favorite FM radio shows. iTunes Tagging tags a song you like while listening on the radio and opens up the iTunes store to purchase it later. Pedometer syncs to the Nike software without the previously-required external transmitter to keep track of steps taken and calories burned. Nine brilliant colors including silver, black, purple, blue, green, orange, yellow, (PRODUCT) RED and pink. Now, this goes against the very way we hold an iPod in normal usage. For a right-handed user, you grip the iPod at the bottom-right, with your index, middle and ring fingers at the very point where the camera is, while your thumb navigates the Click Wheel. We understand that the video mode is primarily going to be shot in landscape mode, for which you need to tilt the device 90 degrees and it works perfectly. But this does raise one pertinent question: Will the iPod Nano not support portrait videography at all? And if it does support it, how does one go about it?